I started making knives in 1989 and have been doing it fulltime since 1996. 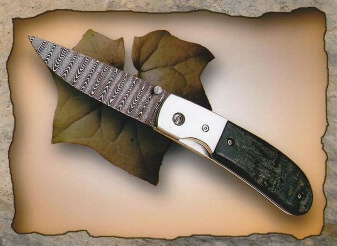 The styles I make are mostly knives such as hunting knives, folders, kitchen knives and daggers. The preferred bladesteel is Sandvik 12c27 or 14c28N for edgeholding and ease of sharpening. Handle materials include indigenous hardwoods, horns, bone and warthog ivory and bolster material if used is brass or stainless steel. Combinations of horn and wood are also used. 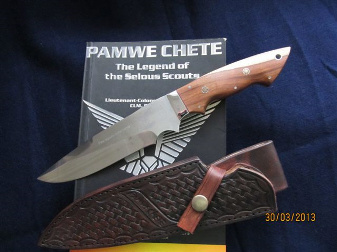 Sheaths are from veg tanned cowhide and are included with the knife. All fixed blade knives are made from 3mm and 4mm Sandvik 12c27 or 14c28N stainless steel. Blades are hollow ground, heat treated to 57/58 rockwell c scale and hand sanded to a satin finish. Handles are attached using epoxy and pins and then finished to fit the hand comfortably. Sheaths are then custom made for each knife. The bladesteel on folders is 2.5mm Sandvik 12c27 stainless steel and all are of locking design using stainless springsteel for the locking liner and 304 stainless steel for the other. The knives are held together with standard metric machine screws for ease of maintenance and care. The larger models are suitable to use as hunting knives while the smaller models are ideal for everyday use. All folders come standard with a suitable leather pouch that can be worn on a belt.